When using sewing labels, you have many choices of how to attach them to clothing. In addition, each method often offers several ways to attach the labels. Before starting your next sewing project, consider the different label options you have and how they work. Sew-On Labels. The style and size of sew-on labels that you can choose is immense. The ways to attach them offer you many choices, too. Most people opt to sew on their labels near the base of the neck. They can choose to sew the labels into the seams, either at the neck or inside of the clothing, usually located on the side. In some cases, you can even loop the label to hang the item on a hook at home or in a locker at school. Iron-On Labels. Iron-on labels are easy because they do not require any type of sewing. You can also remove them in a pinch, if you need to. These labels are usually flat, but it’s possible to come up with different configurations. After attaching the label, place parchment paper over it and iron one last time to soften the label. Button-On Labels. Button- or snap-on labels are designed to come off fast. 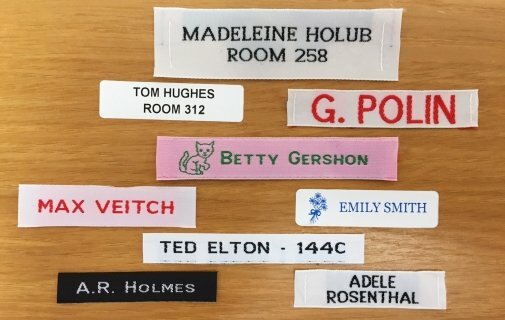 These labels are great for items you plan to use for hand-me-downs, especially when you add a name to the label. You can use this type of label by sewing buttons onto the outfit, and then snapping the tag to them. You cannot make loop labels with this type of label configuration. For more information about the types of labels available, contact us at It’s Mine Labels!